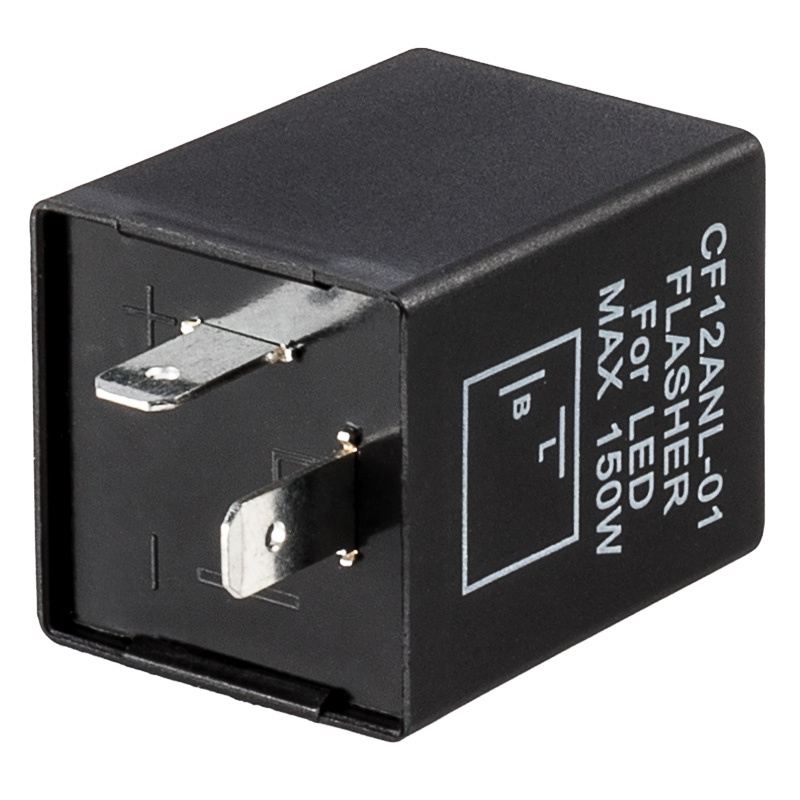 Electronic LED Flasher Relays have no minimum load-12VDC. Eliminates the need for load resistors, turn signals will flash at normal rate with or without LED bulbs. 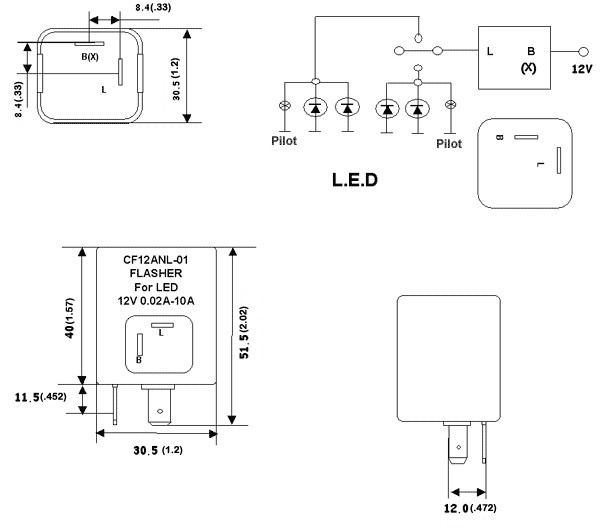 Use the Flasher Selection Guide to determine the correct Flasher Relay for your vehicle. Important Notes concerning LED Flashers: These flashers do not replace all flasher units. 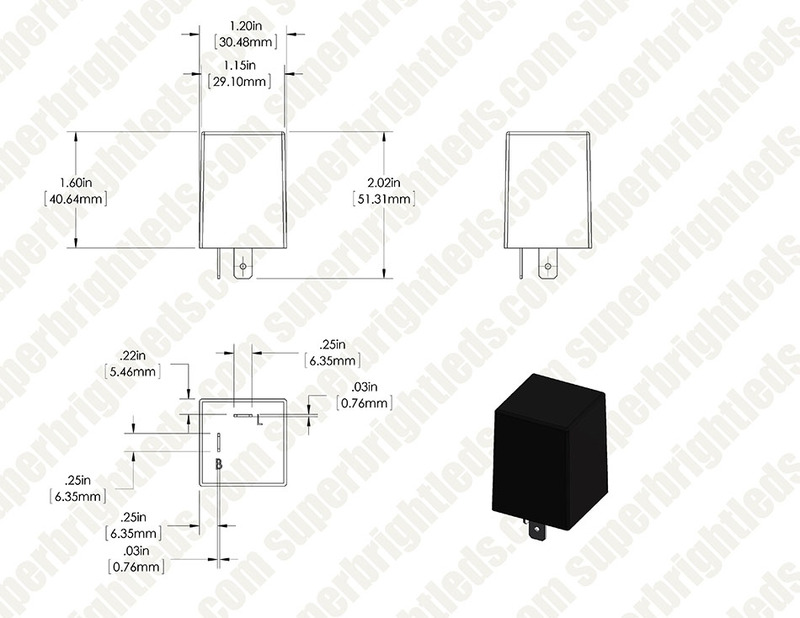 Before you order, please see the pin outs of our flashers in the More Info page and compare with the one you are replacing. Click the part numbers for complete specifications. You can usually find your flasher pin out printed right on your flasher. Failure to check this and installation in an incompatible vehicle can blow your fuse, destroy the flasher and void the flasher warranty. Some of these flashers operate silently, they do not make the familiar clicking sound when operating. One solution is to connect a common automotive relay to the output along with your LED bulbs. I was kind of skeptical at first that it would work. I have to say all I did was plug it in and my lights began to work immediately without hesitation. Just make sure when ordering that the polarities are in the correct position. I'm currently restoring a 1970 Ford Mustang, and have switched almost all the bulbs over to LED. Since I did that, my emergency hazard flashers and turn signals would not blink properly. I bought the FL2-RED and the CF12ANL-01 (the product you're viewing) as advised by SuperBrightLEDs; I am writing the review for this product, as well as the FL2-RED to help inform others doing LED conversions. For my application, the CF12ANL-01 fixed the turn signal problem, and the other flasher relay, the FL2-RED, solved the emergency hazard flasher problem. I've installed one of these in an old pickup truck with LED taillight/turnsignal bulbs & in an older motorcycle that still has the stock bulbs. In both cases, the turn signals & hazard lights work fine with this flasher unit. This unit is only marginally larger than the old flashers, but it should only be a problem if the flasher being replaced is in a space that is already really tight. I talked to a Superbright technician on chat before buying, & he was very helpful. Shipping was very fast, too. I bought this for in my KLR 650 after I added LED turn signals. The flasher was plug and play, no issues at all. Fit the factory location and was a little smaller than the original. Installed 2 of these on an 89 mustang. The relay for the 4 way flasher works, relay for turn signals doesn't.